ArmA 3 will exit its Early Access phase this September, finally unlocking that 300 square kilometer island. Early Access releases have become a big part of digital game sales lately, thanks in part to projects like ArmA 3. 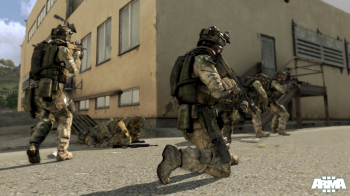 Bohemia Interactive's tactical military simulator wasn't the first to follow the practice, but it helped kick off a new wave of alpha releases by giving early customers a discount and the chance to provide valuable feedback. Of course, these games aren't supposed to be alphas and betas forever, so ArmA 3's testing phase is quickly drawing to a close. The full version of Bohemia's latest shooter will launch on September 12, 2013, whether you're a current customer or interested in a Limited Deluxe Edition filled with extra content. The ArmA 3 Limited Deluxe Edition is packed into a hologram slip case, and features a key card, map of Altis Island, and printed game overview as physical goodies. On the digital side, the limited edition includes ArmA 3's soundtrack, a tactical guide, digital maps, and the original ArmA: Cold War Assault. In other words, it's the Steam Digital Deluxe Edition with a few physical extras, but as long as you haven't purchased that version already, you'll get a good deal. Of course, all customers will also get the finished ArmA 3 game, complete with a 300 square kilometer island, all weapons and vehicles, showcase missions, editing tools, and more. The only thing you won't find, at least not right away, is a story campaign. ArmA 3's plot will come in the form of 3 free post-launch DLC episodes, which is admittedly frustrating for anyone who wanted more than showcase missions. On the other hand, since ArmA's story campaigns are really just extended mission sequences anyway, a delay for extra polishing could be a good thing in the long run. Regardless, finally getting a 300 square kilometer island to explore should be refreshing for anyone who's been playing since alpha. If you're still hoping for a digital pre-order discount, ArmA 3's beta price will remain in place until the September 12 launch.